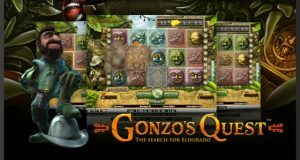 Gonzo’s Quest is a slot game inspired by the adventures of Gonzalo Pizarro, the Spanish conquistador, who was looking for the city of El Dorado. The game was released back in 2010 and is the first platinum slot game from NetEntertainment. It is also one of their most popular games to date. NetEnt has done a terrific job with the graphics of this game, and they are cleverly set to depict a land where the story unfolds. There is the Aztec jungle which is full of rocks and ancient temples. They have various signs and symbols on them. The game starts with you setting sail and taking a small detour to find extra artifacts and treasures. This is when the slot game begins. The soundtrack is terrific and the sound effects that can be heard every time a rock slab falls make the game feel more realistic. Your mission here is to help Gonzo find the city of gold. The game has 5 reels, 20 pay lines, and 3 rows. There are some exciting wild symbols and enticing freespins, too. It also has an innovative set of features which will help you get more prizes than any other casino slots game. There is the avalanche feature where the reels fall instead of spinning. This mode will be triggered whenever you hit winning lines. There are multipliers as well for every new level you reach. The maximum multiplier in standard mode is at x5, and when you go into free fall mode, you can benefit from a multiplier of as much as x15. The game features some of the best 3D animation in the industry and a number of opportunities for players to win. NetEnt keeps adding new features, guaranteed to keep people excited for years. You can win some really big amounts in this game, with the rate of return being really high. It is a game recommended for everyone who likes to play slots. When you hit three free fall symbols on any winning line, you will get to try out the free fall feature. They can be retriggered at any time, and this is what makes the game a proper adventure. You can get additional spins when you use the wild symbol. There is also a question mark which replaces any of the symbols so that you get a winning combination.